The Dallas Architecture Forum provides a continuing and challenging public discourse on architecture and urban design in – and for – the Dallas area. The Forum offers presentations of architecture through public lectures by designers, critics and historians; through topical discussions; and through occasional study tours to buildings and cities locally and throughout the world. 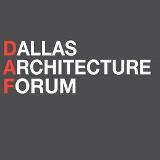 The Dallas Architecture Forum serves as an inclusive arena where people interested in and concerned with the built environment, non-professionals and professionals alike, may interact intellectually and socially. The membership comes from business, development, public affairs, education, the arts and from the design fields. The Forum sponsors an annual lecture series that features nationally and internationally distinguished speakers from disciplines that include architecture, interior design, landscape architecture and urban planning. Speakers have also included noted critics, writers and historians. The Lecture Series grew over the Forum's first decade in both popularity and in the number of lectures offered. The Lecture Series entered its second decade as one of the leading lecture series in the country focused on architecture and related topics. Because the organization seeks to promote an atmosphere where people can interact intellectually and socially, most Lectures and Panels are accompanied by receptions or informal opportunities where members can meet and socialize with our guest lecturers, Panel moderators and with each other.